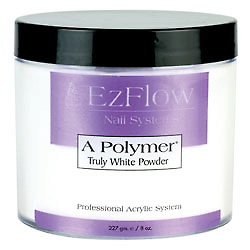 #13141 – EzFlow A-Polymer Truly White Acrylic Powder 21 г. #13142 – EzFlow A-Polymer Truly White Acrylic Powder 113 г. #13143 – EzFlow A-Polymer Truly White Acrylic Powder 227 г. #13144 – EzFlow A-Polymer Truly White Acrylic Powder 454 г.